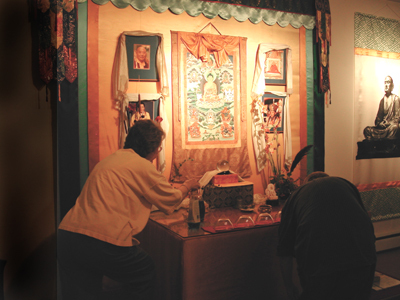 The Shambhala Center of Milwaukee was established in 1993 with the consolidation of the existing Dharmadhatu Buddhists Center, Shambhala Training, and the Nalanda Arts programs. 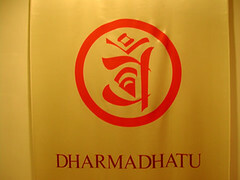 The Dharmadhatu was founded in 1978 in Milwaukee as an affiliate of Vajradhatu International, a Western Buddhist organization founded by the late Tibetan meditation master, Chogyam Trungpa Rinpoche. In 1981, Shambhala Training began secular meditation programs in Milwaukee following a distinct tradition also taught by Chogyam Trungpa, but based on the ancient tradition of gentle warriorship found in many world cultures. Nalanda contemplative arts have also been practiced in Milwaukee since the early 1980s. These traditions include Ikebana (flower arranging), Kyudo (contemplative archery), the Japanese art of Tea, Calligraphy and others. 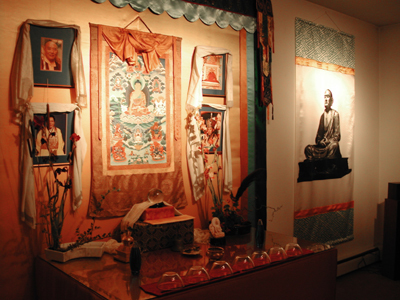 In its formative years, the local Dharmadhatu Buddhist meditation and study center was housed in a store front on East North Avenue and later expanded to North Hackett Avenue. Under the guidance of Dr. David Shapiro, MD., the center sponsored many seminars and programs on Tibetan Buddhist meditation and teachings. Shambhala Training began programs by sharing space with its sister organization, Dharmadhatu, under the guidance of another senior practitioner, Ms. Terry Nelson. Shambhala Training continued to grow with Bill Hebbert’s inspired efforts. His weekly Café Shambhala, every Saturday, has given numerous visitors a pleasant and engaging introduction to the Shambhala teachings. Nalanda Arts began as Shambhala Arts and were practiced by members of both the Dharmadhatu and Shambhala Training communities. The initial participants of Nalanda and Shambhala Training were mostly Buddhist students of Chögyam Trungpa Rinpoche, but their secular nature have attracted a wide variety of participants from all religions and walks of life. By 1990, it became increasingly apparent that the community had outgrown its Hackett Avenue location and a task force was formed to find a suitable property to follow the larger vision of the membership. 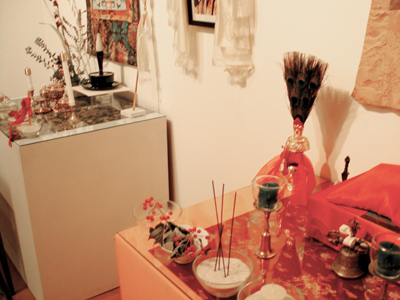 With the move to 2344 N. Oakland Avenue, the Shambhala Center was born. It embodies all three member organizations, Dharmadhatu, Shambhala Training and Nalanda. As such, it is affiliated with the greater organization, Shambhala International. The Milwaukee Shambhala Center emphasizes teaching and education more than ceremony or ritual, as is the case with many other local Buddhist centers. Rather, the community encourages private practice and supports this with regular classes. Dharmadhatu is the Buddhist Church within the Shambhala International organization. It promotes the study and practice of Buddhism as inspired by the Nyingma and Kagyü traditions of Tibetan Buddhism. Beginning with basic meditation practice, students follow a clearly defined path that includes study programs and classes, dathün (a month-long group retreat), seminary, ngöndro preparatory practices, and empowerments for Vajrayana practices. The Center also features visits by distinguished teachers, both Tibetan and Western. Shambhala Training is founded on the premise that humans possess a basic, intrinsic wisdom that can help solve the world’s problems. This wisdom does not belong to any one culture or religion. Rather, it is a tradition of human warriorship that has existed in many cultures throughout history. In this tradition “warriorship” is not founded on a dominating, aggressive mindset. Instead, Shambhala Training helps people appreciate their minds and hearts just as they are. Through this appreciation, they develop an openness and clarity capable of spontaneous and genuinely helpful action. Through lectures, readings and the practice of sitting meditation, Shambhala Training awakens the innate qualities of a true warrior: dignity, fearlessness, and gentleness. The Nalanda Gate comprises a number of disciplines and activities that explore culture using a contemplative approach such as Ikebana (Japanese flower arranging), Kyudo (archery), and Dharma art (including dance, movement exercises, feng shui, etc.). 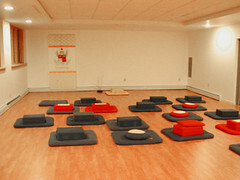 Please refer to the Shambhala Center of Milwaukee’s website for current program information. The Milwaukee Shambhala Center offers a wide variety of activities, classes, and meditation periods for followers of all levels. Notably, the Saturday morning Cafe Shambhala is an open house of meditation instruction, coffee, goodies, and lively discussions, where the public is always welcomed to learn more about Shambhala Buddhism. Weekly Schedule: Sundays 9-11:45 A.M. Buddhist Meditation Tuesdays 7 P.M. Meditation and Free Talk Wednesdays 8 P.M. Buddhist class in conflict resolution Thursdays 7 P.M. Yoga and Meditation Saturdays 9 A.M. Cafe Shambhala Please visit the Milwaukee Shambhala Center’s monthly calendar for current schedule information.